A biblical concept - Often in songs each generation. New wine won't fit into old wineskins. 2018 Conference in Sydney. KING OF GLORY! This was a profound and moving God experience in every way. It was a privilege to be there and I thank God for making it possible. After health issues it seemed impossible from a logistical, financial, emotional, and even spiritual perspective only two months before I went. He made a WAY. I knew it was a Calling for me to attend. I sat in the far corner up high in the gallery of the Wesley Conference Centre. It was a joy to be a part of the whole experience but to also be in a position to 'see' with spiritual as well as natural eyes, the whole unfolding. I was there, I believe to PRAY. in our relationship with God. This, I believe, has become deeper, clearer and more REAL. God the Holy Spirit ever continues to teach, reproof, correct and guide our lives. 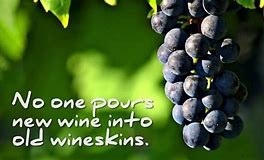 When once again, (It has rolled over me many, many times in the past thirty+ years) a song about new wine and new wineskins was sung and someone proudly proclaimed that the new wine was pouring. I asked the Lord a a question and was impacted by His Reply. It came at the Conference but was confirmed to me as I awoke the next day. This then is the answer. Many here have adapted to changes their whole life. After 65 years of age, folks quickly must learn to change physically, emotionally and in relationship with You. Our homes and life circumstances have changed. Friends and family have gone home or moved to far-away places. I stood up high in the Conference Gallery and asked a question. What happens to the ‘old’ wineskins? This, I believe was His Answer in my heart. I am the Ancient of Days – I am unchanging – I am eternal! My Children remain my Sons and daughters in relationship to Me FOREVER. Old wineskins are grafted into the blood Covenant covering my children’s lives. New wine is poured into new wineskins. Yet, the old skins although becoming strained, and broken with age, still contain the essence, the fragrance, the holiness of lives lived with memories, and maturity that enriches the future, and makes it more vital. Nothing, nothing is ever lost, while traces of the old wine and the bubbling flow of the ‘new’ are fully embraced. No change is therefore absolute, but progressive and ever ‘alive’ and enriching. In this then, I truly am. In quietness I was able to pray for all the beloved in the Sydney Conference Centre.